Fruity fun for veterans and new players alike! Sizzling Hot™ deluxe is one the most played Vegas slots on our Gaminator online casino. Combining the classic flair of times long past with high win rates and huge payouts, and you got yourself the perfect cocktail for hours of fun! In it’s deluxe version, Sizzling Hot™ offers you more win lines, higher mutliplicators on both scatters and wilds, higher average payouts per round and even more free spins and higher payouts during free spins! 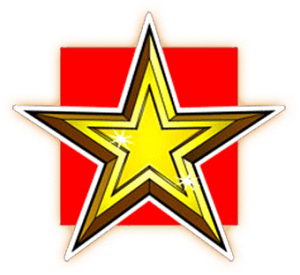 If Gaminators Sizzling Hot™ deluxe special symbol, the golden star, appears three times on any reel, you will receive a win, even when the stars are not on the same pay line. Deluxe fun with no downloads required! Of course nothing has been changed about core game mechanics. Sizzling Hot™ deluxe is being played on along 5 wheels, but with more win lines this time. This already is one oft he bigger differences that sets it apart from other, slightly more modern slots like Book of Ra™ or Lord of the Ocean™ for example. While other machines near flood the screen with countless lines to get your hopes up, here gameplay stays focused and easy to observe. Which, counterintuitively enough, does not mean you get to win less at this slot machine – the burning 7, this game’s scatter, has a very high chance of appearing along any of the five lines, replacing other fruity symbols and instantly boosting your payout this very round. At the end of each round, your winnings will be added towards your account (and you can always take a look at the paytable at the bottom of the screen to know what the fruity symbols are worth!). Working from left to right, blinking pay lines show you which bonuses, symbols, and combinations have scored you credits this round. This is also the point in time when new players get to understand why this slot is so popular on Gaminator; with a multiplier of up to 400x any round can suddenly turn into the jackpot of their lives! Hot Vegas action for everyone! Sizzling Hot™ deluxe is our love letter to classic slot machines of a bygone era, our attempt at providing you with prestigious yet simple gaming fun that most modern machines sorely lack. No matter if ist melons, plums, lemons, grapes, oranges or even cherries filling your screen, the icons and symbols have all been redone and look more inviting than ever. Even if you have never played a low-line slot machine before, it only takes a few spins to get the hang of it, and we have no doubt this game will keep you busy for hours on end! With one of the most generous scatters on Gaminator any round can be the big one – as soon as you see it three times on your wheels – with a bonus multiplier of up to 400x Sizzling HotTM deluxe is one of the most profitable games to play on Gaminator, a fact both our new players and veterans alike make great use of every single day. Even without specific bonus games, the return to player rate (RTP) is at a staggeringly high rate of 95%! Complex bonus games or confusing mini-games are not part of the Sizzling HotTM experience. We wanted to focus on bringing you simple, fun and yet exciting slot fun that stays interesting throughout your gaming sessions -with one caveat. Our renowned Gamble-Feature has made its way into your slot, your chance to double your winnings every single round! In this mini-game, a stack of cards will appear, which will automatically be cut at a random position. Some cards will be revealed, and you need to bet on what color the next card turned over might be. If you are right, then you receive double the amount instantly, if you did bet wrong, then your winnings this round are gone completely!